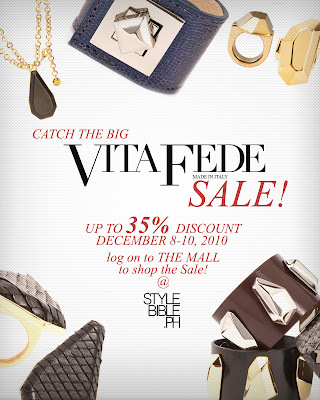 manila fashion observer: Vita Fede’s Anniversary Sale! To mark its one-year presence in the Philippines, Vita Fede, the luxury accessories line that is frequently seen on high profile celebrities is teaming up with StyleBible.ph for a three-day exclusive online sale from December 8 to 10. A staple in the wardrobe of Hollywood A-listers such as Kate Hudson, Jessica Alba, Cameron Diaz, Katherine Heigl, Lindsay Lohan, Emmy Rossum, Olivia Palermo, Fergie and Jessica Biel, Vita Fede is also a favorite among Manila’s fashionable celebrities including Ruffa Gutierrez, Georgina Wilson, Anne Curtis and Kris Aquino. Known for attention to detail, Vita Fede is committed to using only the finest materials and techniques. The pieces are all hand manufactured by the same skilled artisans tapped by Fendi, Gucci, YSL and Dior, who are very particular about their craftsmanship, making the items very covetable pieces. As a way of thanking everyone who supported Vita Fede’s launch in the Philippines, selected pieces will be sold at very special prices--as much as 35% off regular retail prices from 12:01AM on December 8 to 11:59PM on December 10 with StyleBible’s The Mall playing host to this exclusive sale event. StyleBible.ph is the online counterpart of Preview magazine, the Philippines' best-selling fashion magazine. Like the glossy, the site focuses on the latest in local and global fashion, the newest in beauty, and the hottest around, including special deals and discounts such as this. “I'm incredibly excited about Vita Fede's online sale, which will be hosted by StyleBible's The Mall as it will be our first online selling event. I know many fashionistas who'd love to get their hands on a few of their accessories and the fact they'll be selling at a big discount is a huge plus. My only tip is to really mark the dates on your calendars to make sure you don't miss out!” says Isha Andaya, StyleBible.ph managing editor.